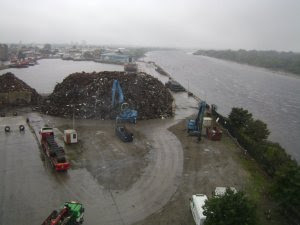 Since this photo was taken, a ship has since arrived and they've been moving the scrap metal onto the ship. It's still an impressive little pile, however. Then we headed off to see a little of town. 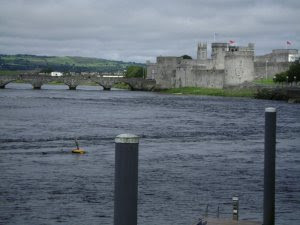 The castle below is King John's Castle in Limerick. It was built about 800 years ago and had been attacked numerous times over the years, both above ground and below it through the use of tunnel warfare. And that was pretty much it for us. We crashed particularly early, absolutely exhausted from the long flight from Seattle. The next photo is of our hotel the next morning (which is today, actually). It's the tallest hotel in Ireland if their claims are to be believed. *nodding* Our room is on the other side of the building. These people have the "pretty views" rather than the junkyard views we got. We headed off to the bus and rail station for a bus tour of the area. 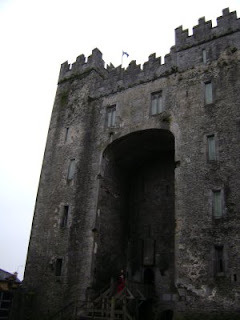 We met up with a small group of people, piled into a small bus, and headed out to Bunratty Castle. There was even some wildlife sightings. 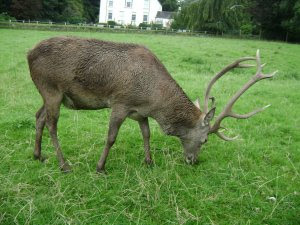 They were in an enclosure, however, which makes spotting them particularly easy. 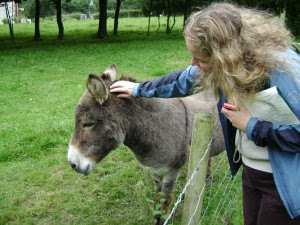 =) Then Amanda decided to become friends with one of the donkeys. 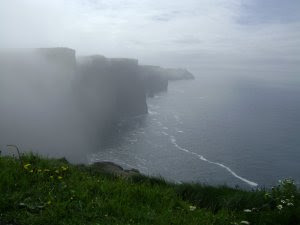 From there, we headed out towards the Cliffs of Mohar, but the weather, alas, was not cooperating. You may recognize these cliffs as those used in the movie The Princess Bride. Upon our arrival, however, I can't say I recognized anything. 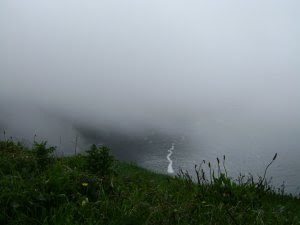 A peek of the Atlantic Ocean was there, but the cliffs were infuriatingly surrounded in fog. But alas! It started to clear! And by the time we left, it was almost entirely clear! The weather, my friends, can change in an instant! 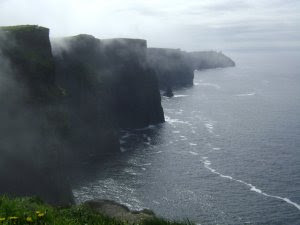 So we were rather delighted to see the cliffs in all their glory, towering hundreds of feet out of the ocean. 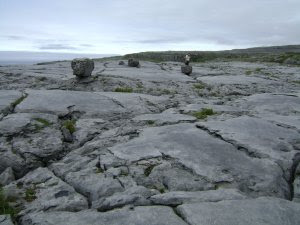 The last major stop was to a desolate rocky area known as the Burren. In case you're wondering what any of this has to do with letterboxing, I planted a letterbox there under that rock in that last photo where Amanda is standing. 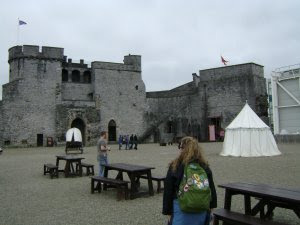 Amanda also planted one at Bunratty Castle. Look for the clues soon! 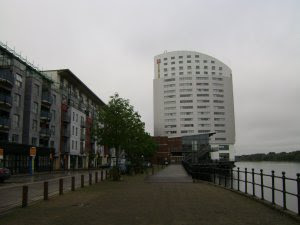 And once again, we are back in the hotel room at Limerick, waiting for daylight to head back to the Shannon airport and the end of our two-day whirl-wind adventure. The west coast of Ireland is one of my favorite places. You need to travel down the coast from the Cliffs next time. The shoreline is completely natural with rainbows appearing several times a day. 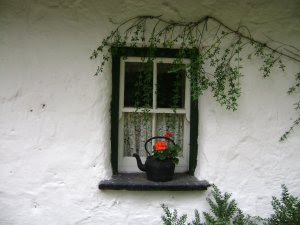 I have a friend that owns a house on the road to Bunratty Castle... hope to visit some day! Oh the cliffs were beautiful!! I love the castles too. 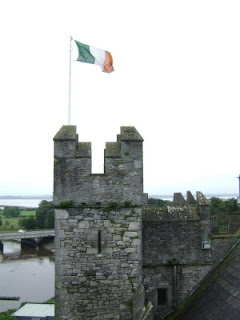 Now I realy need to go to Ireland! I'm dying to go!! :) Hopefully someday... Thank you for sharing your trip with us Ryan. I loved it!! THESE PICTURES ARE WONDERFUL RYAN! I'm glad you're having a great adventure. And I love the photos of the "Cliffs of Insanity!"